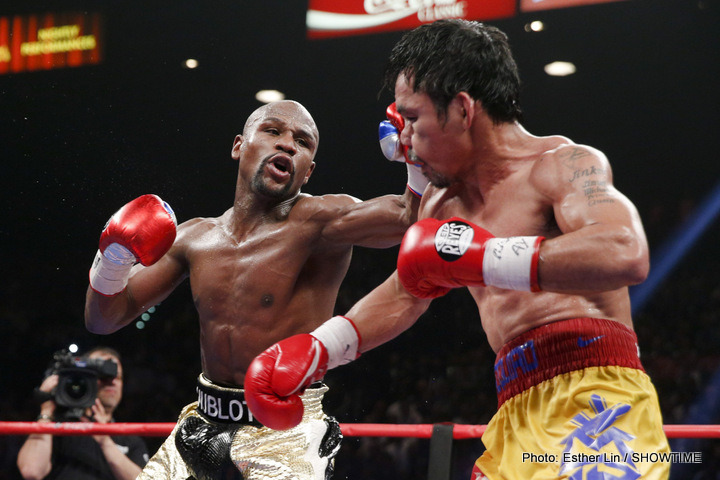 Five-weight world champion Floyd Mayweather has been stripped of the WBO welterweight belt won from Manny Pacquiao in May. The 38-year-old failed to pay the WBO a $200,000 (£128,000) sanctioning fee by the 3 July deadline. Mayweather had been expected to relinquish the title by now, saying he planned to do so following his points victory over Pacquiao. Fellow American Timothy Bradley will now become the full belt holder. After Mayweather defeated Pacquiao, he had declared he would vacate all his titles in order to give younger fighters the chance to win belts. “The WBO World Championship Committee is allowed no other alternative but to cease to recognize Mr Floyd Mayweather Jr as the WBO welterweight champion of the world and vacate his title,” said a statement on wboboxing.com. Mayweather, who still holds the WBA and WBC belts at welterweight, has until 20 July to appeal against the decision. He is expected to stage one more fight in Las Vegas on 12 September, although he has yet to name the opponent. The WBO created a vacant interim welterweight belt for the 27 June fight between Bradley and Jessie Vargas.